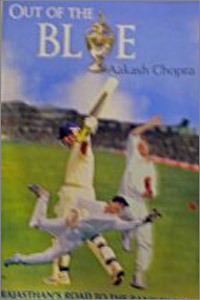 Aakash Chopra was never actually a man in blue but he did represent India in whites as and his two books, Beyond The Blues and this latest one, Out Of The Blue, both make reference to the same colour. Both books, however, concentrate on the domestic cricket scene and both have made for fascinating reading. Aakash is undoubtedly highly articulate and his writing style is exemplary, easy to read, competent, forthright and entertaining. Beyond The Blues concentrated on Delhi’s winning of the Ranji Trophy in 2007-08 but, soon afterwards, Aakash was left out of the Ranji Trophy squad and was taken on by Rajasthan, hardly one of the favourites. This book details how they defied all the odds to win the Ranji Trophy for the very first time in their history. What is endearing about this book is how Aakash goes through many of Rajasthan’s players to set the scene. Many of these players will be unfamiliar to even seasoned cricket fans so this is an important and interesting section. ODIs and Twenty20 matches in India draw sell-out crowds and, whilst Tests are not always as well attended, domestic cricket attracts the proverbial man and his dog so Aaakash’s setting of the pre-Ranji Trophy scene does favours to the reader and the players. It draws upon their experiences: experiences which may shock and certainly surprise the reader as to how difficult life can be and the sacrifices which have to be made to become even a state player and the pitfalls along the way. The matches are naturally well detailed and a scorecard accompanies each chapter and match, an in depth scorecard but I would have liked to have seen the fall of wickets included. Aakash himself had a very good year including his highest ever score and, in the process, became one of the elite to make a triple hundred. The structure of the points system is explained and the way in which the teams play the game as a first innings lead can lead to further progress within the competition. The scores are truly fascinating. Another very interesting point is the snippets which accompany many of the pages. All relate to Ranji Trophy records and are an excellent addition. Out Of The Blue may relate to the 2010-11 season but these titbits lend even more interest to an already interesting account. Aakash Chopra may have been slightly unlucky not to play more international cricket but he seems to enjoy himself on the domestic scene, continues to do well and, on the strength of his two books, could have a secure future as a writer after cricket. This book is another welcome and interesting addition to any fan of Indian cricket’s library and HarperCollins have made another very astute choice in publishing it.